Multipule software skills are needed as a TA. it will give you a good start. but also wanted to make a good workflow than the default Maya settings. also like multiple Outliners for Select>MMB D&D and so on. And it's Volume 3.0 Now. But , please use it as your own risk. by users . Great thanks . but want to keep what's good about in Maya , so it's not completely Softimage Keyboard . Also , HotKey settings has some limit , and by moving some keys will loose some settings that has been in default. Notwithstanding, this will give Softimage user a friendly touch to Maya UI. For example, you used to tap [Spacebar] as Select , z Key button for [TrackTool] . So , here's some features that was covered .... Blue letters shows newly added features in Volume2 . Even though , there might be what you don't like , customize it your self . For Maya users , uses some commands , if likely . In Maya "Keyboard Mapping" is called HotKey , which is Window > Preference > HotKey Editor . Files saved in HotKey Editor goes to user directory , in 3 Mel files . To clear Keyboard settings to default , make 3 files empty . with 3 files , userHotkeys.mel　userNamedCommands.mel　userRunTimeCommands.mel . Keyboard setting is very simple as below , exsample shows setting 8 Key button as OutlonerWindow shortcut. 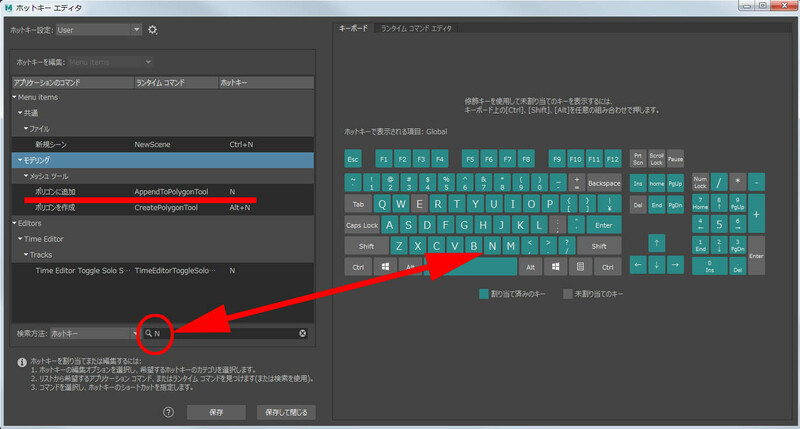 To set custom script , Mel or Python , to Keyboard Button is quite easy . and set it to the one you want. and set the commnad to End Keyboard Button. After editting , do [Save] , some command needs to restart Maya. userRunTimeCommands.mel has Custom Command script . Some functions achieved in this HotKey . Also s = MoveRotateScaleTool moves in LMB , very convenient. n Key button Add Polygon Tool , which will help great in modeling . m Key button is MoveComponent , which is using Maya 2014 new feature SelectMultiComponentMask . For former version this m Key button will act as Move Point Tools . 9 Key button is HypergraphHierarchyWindow in schematic . with selecting in MMB and D&D to another Outliner Window . Most common windows are Multiple view , now . which will be used to keep an AttributeEditor showing , and in many as you like . More in option , GraphEditor has BufferCurves and Infinities On when showing . From GraphEditor Alt+x will show the AnimationCurveAttribute from selected one FunctionCurve . This way you can access to the Tangents of the curve . Alt+a copys the AttributeEditor Tab , but the SpreadSheet is not On . Shift+x ＝ set XYZ Scale Key animation , Shift+c ＝set XYZ Rotate Key animation , Shift+v ＝ set XYZ Translate Key animation . Command is also listed , so you can only use the likely ones. Blue letters shows newly added features in Volume2 , Green is V2.1 . There's still more improvement to do , but this is the first release . 3 Mel Files to release for HotKey , Copy to the Directory , use as your own risk.